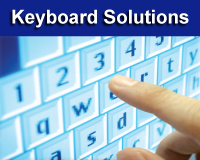 IMG has been providing on-screen keyboard solutions since 1995. Due to the varied nature of our customers, the inherent flexibility of software, and specialized needs of any human-based user interface, we have many solution(s) and variations available. Please take a moment to help identify the solutions most appropriate for your needs.